Space assignments are now posted under the About tab. The 2018 poster was created by Phil Coleman, Corvallis Art Guild's Hanging Around Town Chairperson. at 120 NW 4th Street, Corvallis. Artists displaying work in the Clothesline Sale are Exhibiting Members of the Corvallis Art Guild. All Exhibiting Members who have paid their dues by December 31 are eligible to participate in the 57th annual Clothesline Sale of Art. An entry fee of $25 is required. This fee helps with some of the expenses. Participants will contribute a 10% commission of their gross sales from the event to CAG. 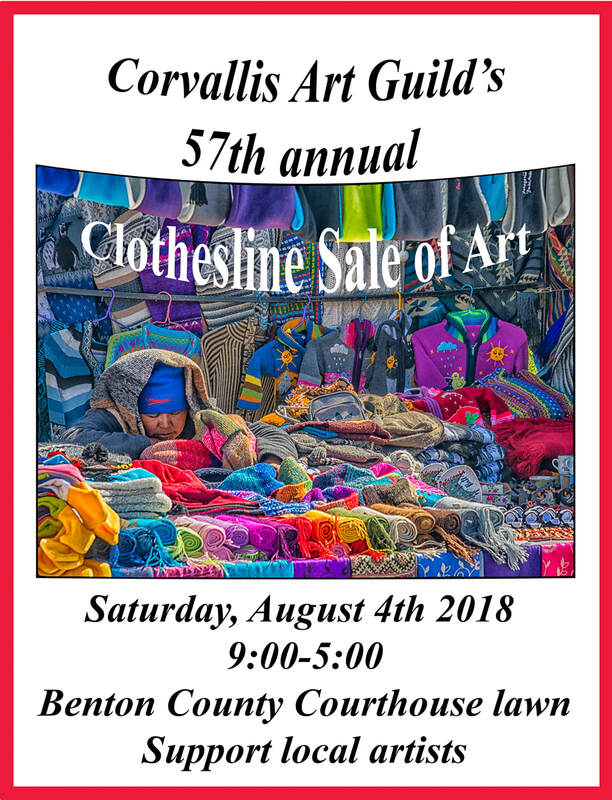 To indicate that you want to participate in the 2018 Clothesline Sale of Art, print out the reservation request form. Complete the form and prepare a check made out to Corvallis Art Guild (NOT CASH) for the $25 entry fee. Either mail the form and check to Brynn Carter, 2018 Clothesline Sale Chair, at 950 SE Powell Ave. Corvallis OR 97333, or bring your reservation items to the July 9th CAG meeting. No reservations will be accepted before the July meeting. Requests for spaces are determined by contributions to operation of the CAG in the past or present. Otherwise, it is first come, first served. Send a jpeg image of one painting, with the title and your contact information to Brynn. brynncarterphd@gmail.com Your image and information will be included in the gallery below.